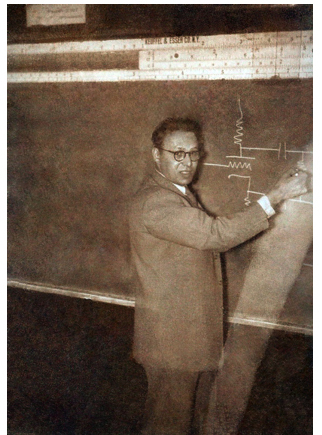 Edgar Villchur teaching the course Reproduction of Sound, whose substance and syllabus he designed, at New York University in 1952. Edgar Villchur and his family had a good life in the early nineteen-fifties in their new hometown of Woodstock, New York. Villchur was driving two hours to New York City one day a week to teach a night class at New York University. He had proposed the course to the administration at NYU, and they had accepted the idea. The NYU engineering faculty had decided to overlook the fact that Villchur’s master’s degree was in art education, rather than any scientific or engineering field. He was highly intelligent, well-read in his field, and articulate in both speaking and writing, and the topic was one that was in the forefront of the public’s mind. People were buying sound systems for their homes, and they wanted to know how they worked, how to buy them, how to use them, and how to repair them. A new college-level course was born: Reproduction of Sound. In the syllabus for his course, Villchur went through the various components of a home sound system. At the time, he was also writing articles for various publications, including Saturday Review, a publication known for its mix of cultural, political, and scientific writings. One of Villchur’s articles illustrates his deep interest in the loudspeaker as the biggest problem in the high-fidelity systems of the day. 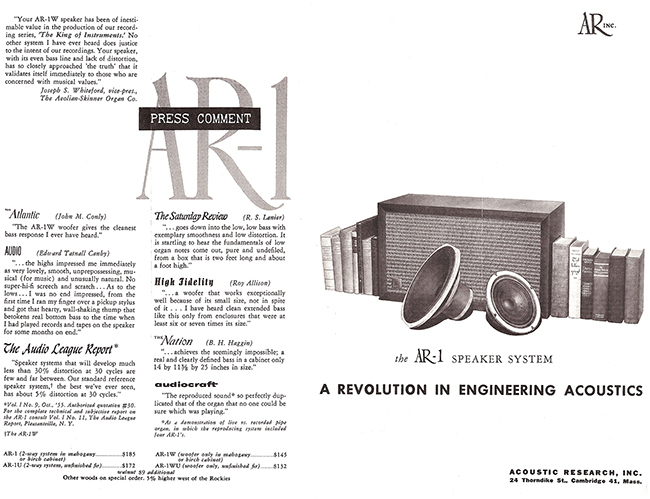 “Taken all together,” he wrote, “the weakest link in the chain of audio reproduction remains the one which seems, to the lay eye, to have the greatest exterior efficiency—the speaker itself.” (Villchur, E., “A New Speaker Principle,” Saturday Review, September 27, 1952, Pages 60-61). No, it was not the acoustic suspension loudspeaker he was on the verge of inventing. It was a French design for what was called an “ionic” loudspeaker, which is based on a varying electrostatic field. In describing the limitations of current loudspeakers, he used the analogy of acting to explain the problem of mechanical springs: “Ideally the device must be entirely passive, speaking only as continuously directed, without asserting any oscillatory life of its own; like a good actor it must efface its own personality in favor of the characters it plays. But actors do not entirely lose their own personality characteristics. The mechanical device retains some of the behavior patterns determined by its inherent inertia and restoring force, coloring the imitation and making it less than perfect.” Those with interest in the details of this proposal can read the entirety of ‎ Villchur’s article here. But while he was speculating on the potential for this new French invention, Villchur was also working on the issue in his head. The essential problem, he knew, was in the mechanical spring that moved back and forth to create the sound in a loudspeaker. A mechanical spring will inevitably introduce distortion. So, he thought about what could replace that spring. He said to himself that the most neutral form of spring would be an air spring. But he rejected that idea at first, because he couldn’t figure out what mechanism would return the spring to its original position. One day, as he was driving to New York City to teach his class, he suddenly realized that the return of the spring was not a problem. Just as a flywheel returns through momentum, the air spring would return to its original position on its own if the chamber was exactly the right size to create the necessary amount of air pressure. 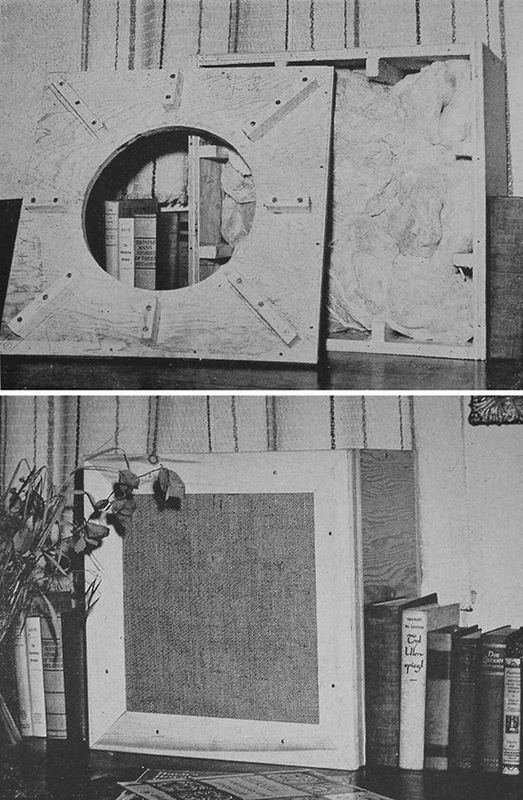 Edgar Villchur’s wife Rosemary, an expert draftswoman, designed the speaker prototype’s speaker cone surround and sewed it out of mattress ticking. Villchur began building a prototype of the new invention. He started with an ordinary speaker, cut it apart, and threw away the mechanical spring. He figured out the geometric requirements and calculated the air pressure factors. He needed a speaker cone surround that was both flexible and sturdy. 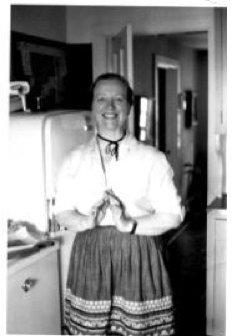 His wife, Rosemary, had been an expert draftswoman during World War II, and had done mechanical drawings of defense installations. She came up with the idea of using mattress ticking—a material similar to denim that had the qualities Villchur was looking for. She looked at his rough three-dimensional model, translated it into a two-dimensional template, then cut out the ticking and sewed it into the needed shape. Despite the careful calculations, the first prototype turned out to be too large to provide the springiness necessary to return the speaker to its neutral position. Villchur realized that sometimes mathematical calculations don’t work as well as simple trial and error. He estimated how far off the dimensions were and built a second prototype, which worked perfectly. Hooking it up to his sound system, he was delighted to find that the low bass notes came through clear and free of distortion. Villchur knew right away that he had discovered something important. The prototype of the first acoustic suspension speaker, shown disassembled and assembled. One night after teaching his class at NYU, he went for coffee with one of his students, Henry Kloss. Villchur had been hinting about his invention in class, and Kloss wanted to know more. Villchur explained the principle in a few sentences. In an interview many years later, after he had become an audio innovator in his own right, Henry Kloss said that hearing about the acoustic suspension speaker was one of the highlights of his life. Soon afterwards, Kloss drove with him in Villchur’s 1938 Buick up to Woodstock, where Villchur demonstrated the new speaker. He put on a recording of E. Power Biggs performing Bach’s Toccata and Fugue in D Minor (BWV 565), one of his favorite pieces. Biggs played it on the Baroque organ at the Germanic Museum at Harvard University. Biggs himself had supervised the rebuilding and voicing of the organ. His definitive performance of this piece demonstrates extremely low and resonant notes played by the foot pedals of that organ. Kloss was amazed by the quality of Villchur’s speakers and their ability to reproduce those bass frequencies with such fidelity. He immediately proposed that the two of them go into business together and manufacture loudspeakers. Villchur turned him down at first, saying, “No, this is for the big boys.” He wanted nothing more than a quiet life in the country, writing his articles and tinkering with electronics on the side. Thinking about it some more, he realized he might be able to make some money from his invention, so he decided to patent the idea and sell the patent. Without the money to hire a patent attorney, he spent several months studying the complexities of writing and filing a patent. He had a cousin who was a lawyer, who referred him to a colleague who specialized in patents. In a 2005 interview with David Lander of Stereophile magazine, Villchur said, “The estimate the patent attorney gave me was too high. I said, ‘How about if I just come talk to you and you tell me what I need to do to write my own? How much would you charge for that?’ He said, ‘$30 an hour.’ And I said, ‘I’ll take one.’” Villchur ended up completing the patent application himself, and was awarded patent No. 2,775,309 on December 25, 1954. Drawing from Edgar Villchur’s 1954 patent of the acoustic suspension loudspeaker. 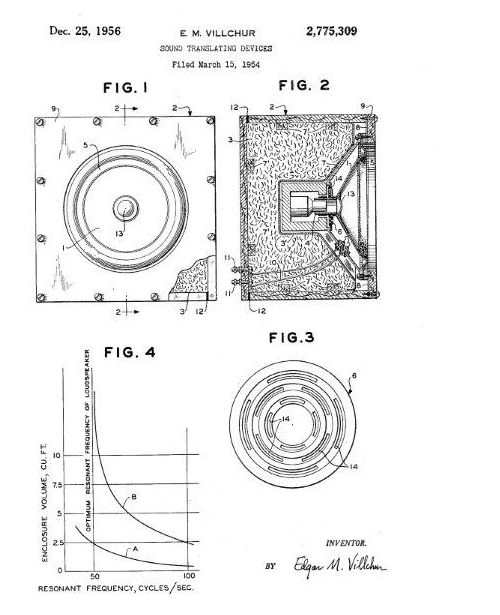 Henry Kloss reiterated his desire to open a factory with Villchur, so they could manufacture the newly patented acoustic suspension speaker. Kloss had a loft in Cambridge, Massachusetts, where he was building wooden cabinets for speakers and selling them by mail order, so there was already a location for the nascent business. Villchur approached friends and family members, asking them to invest in his venture, and raised several thousand dollars—enough to get started. Villchur started commuting from Woodstock to Cambridge and putting together his company, which he named Acoustic Research, Inc., or AR. He decided that the only way he would be happy as a businessman was by doing things his own way. It started with the company logo, which he rendered in his favorite font—Trajan, based on lettering from ancient Rome. This was the same font he had used to paint his then-girlfriend’s name, “ROSEMARY,” on his jeep in the South Pacific during World War II. At Acoustic Research, he hired friends as executives, and designed the administration of the company to be fair and equitable to employees. And despite the fact that he ignored the usual rules for running businesses profitably, he made a success of AR. In later years, Villchur was often praised for his revolutionary invention of the “bookshelf speaker.” It always rankled him, because the size of the speaker cabinet was secondary to the actual improvement in sound reproduction. From the point of view of consumer preferences, however, the difference between speakers that stood five feet high and ones that sat unobtrusively on a shelf was highly significant. It took the sound system from something electronics fans could display only in their basements to something their wives would happily accept as part of the living-room furnishings. The market for high-quality sound systems expanded exponentially. If you have ever handled a conventional loudspeaker, you will know that the moving system is mounted on elastic suspensions: when you depress and then release the cone it springs back to its normal position. The necessarily imperfect quality of these mechanical springs (which, in technical language, become non-linear on large excursions) is the greatest single source of speaker distortion. The condition cannot be cured by removing the spring tension from the suspensions, because elastic restoring force is indispensable in modern speaker design. 1. Reduction of bass harmonic distortion, from values currently accepted as unavoidable in speakers, by a factor of 4. 2. Uniform and extended low frequency response. We believe that the AR-1 establishes new industry standards in this respect. 3. Determination of optimum cabinet size as conveniently small—an extra dividend. The size of the AR-1 speaker cabinet is dictated by acoustical considerations, and represents an advance in, rather than a compromise with, quality. No allowances for size should be made in evaluating the performance of the system. Villchur did not want to be remembered as the person who made loudspeakers smaller. He wanted his invention to be acknowledged for its superior quality, regardless of size. The fact that its small size made it a highly marketable commodity helped make the company successful, but Villchur’s pride in his innovation was always linked to the ability of the loudspeaker to reproduce music more faithfully, and to allow people to hear in their living rooms what they might otherwise have to go to a concert hall to experience. All the elements had come together: teaching a class in sound reproduction got him thinking about the problems in the various components of a sound system; writing articles on the same subject made him aware of other research and its successes and limitations; driving to New York gave him the quiet time to ponder all the scientific issues involved, and time to come up with a new design; being turned down by the big loudspeaker manufacturers showed him that he would have to make the product on his own; and meeting Henry Kloss, who was already in the speaker cabinet business, gave him an easy way to start manufacturing the speakers. The rest, as they say, is history—history we shall explore in future posts. I am deeply indebted and grateful to Tom Tyson for his generous help and especially for access to his archival materials on Acoustic Research.